The entrance is adorned with ginkgo trees on either side; they are also known as maidenhair trees. These trees have a rough bark, a bit like the acacia and the black poplar but are most distinguishable by their leaves which are like no other tree. Marvel at these trees and contemplate that they are of a completely different sort from all others you will see and that they belong to a prehistoric age, dating back over one hundred million years. It is quite possible that tyrannosaurus rex might have nibbled the top of this tree, and benefited from the healthy properties of its nectar which might have helped this mainly meat-eating dinosaur's digestion, as this prehistoric monster was around about seventy million years ago. Most of the trees in London are deciduous trees, i.e. broad-leaved that shed their leaves in the winter. A few are conifers, i.e. with needles and cones. All come within these two categories except for the Ginkgo which is in a category all of its own: Ginkgoaceae. These trees are sufficiently numerous in London to mention, but do not become too distracted. These are not true British trees in my mind; they don't really fit. The two Ginkgoes are on the right. solitary, alternate; fan shaped; long stem; fibre like, leathery texture. oval shaped, fruitlike; grow in clusters on long stems. 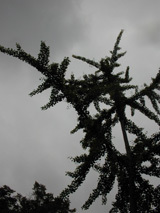 grows to about 30 metres tall and thin, vaguely Christmas tree like. general: fairly common in squares and streets, easily recognizable once you become familiar with it. Seething Lane Gardens is circled in white. The entrance has two ginkgoes on each sideof it.